This gadget looks like a precursor to the devices medical officers use to scan patients in science fiction, and it is not far off. The MyotonPRO tests muscle tension and stiffness. The device is being used on the International Space Station by ESA astronaut Alexander Gerst. Part of the Myotones experiment, Alexander is using the smart-phone-sized device to investigate the human resting muscle tone system. By default, our muscles are always slightly contracted. This is how we maintain posture and respond quickly to sudden movements. Our muscles reflexively tense to maintain balance and reduce damage when unexpectedly pulled or stretched. Muscle tension and stiffness are also good indicators of flexibility, strength, and general health. Of course, our muscles evolved to do this on Earth. In weightlessness, muscles lose functionality and mass. This phenomenon is well studied, and astronauts exercise for approximately two hours a day to prevent muscle wasting away. The Myotones experiment is focusing on resting muscle tone, about which researchers know much less. Sponsored by ESA, German Aerospace Center DLR and the UK Space Agency, the experiment is run by the Center of Space Medicine at the Charité University Medicine Berlin. During his mission, Alexander will take readings from different muscles using the device, which emits a painless pressure pulse and records how the tissue responds. This video of a Myotones session on the sole of Alexander's foot shows its ease of use. As with most experiments on the Space Station, the data recorded in space will be compared to those taken before and after flight. 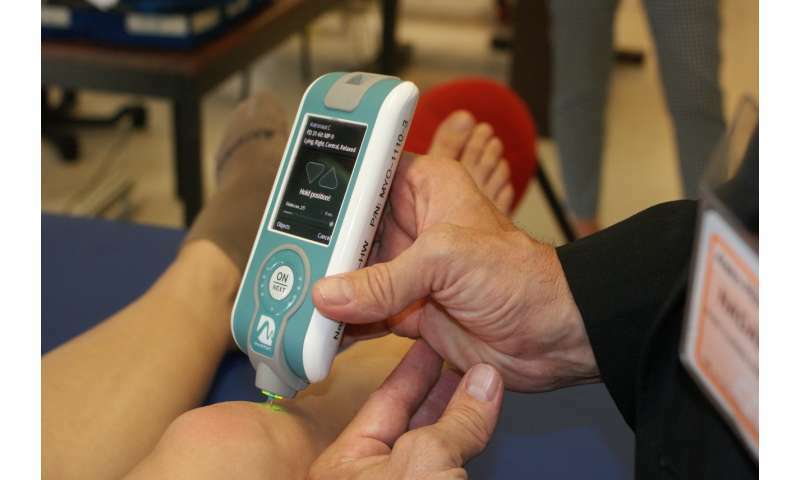 The MyotonPRO device is also demonstrating this non-invasive technology that delivers data more quickly. While not quite the futuristic scanner we see in science fiction, this could still make for a more efficient diagnostic tool for terrestrial and extra-terrestrial medical professionals. In addition to keeping astronauts fit and healthy on longer missions, the results of Myotones will aid in diagnosing and rehabilitating people with muscle degeneration or injury such as the elderly, the bed-ridden, load-carrying workers, and athletes. Read more about Myotones in this blog post and follow more of the great science happening during Alexander's Horizons mission on the blog.